On the morning of 3 April, Abhinandan Pathak stepped off his sleeper compartment at Lucknow’s Charbagh Station. A posse of five men, including his 14-year-old son, Shivam, accompanied him. He wore white trousers and a white kurta, a gold Nehru vest, and a turban and neck sash coloured saffron and green—the colours of the Bharatiya Janata Party. 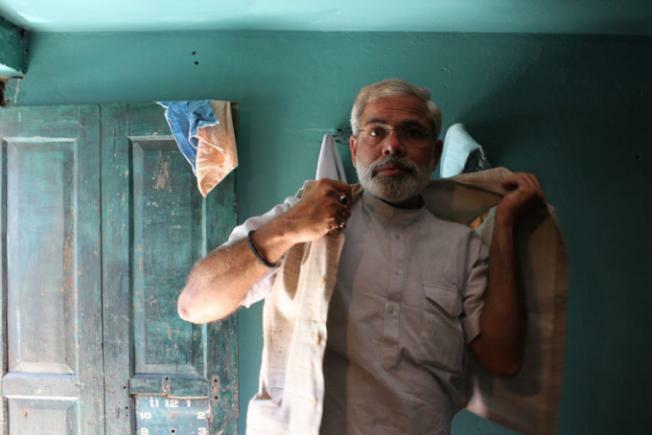 His silver hair and beard, and a pair of rimless spectacles, rounded off Pathak’s imitation of the BJP’s prime ministerial candidate, Narendra Modi. Pathak is a physical education teacher from Saharanpur, Uttar Pradesh, who has taken three months off from work to travel around India and campaign in support of the man he resembles, and whom he thinks should lead the country. “My first journey to campaign for Modi was by bicycle from Saharanpur to Meerut on January 27,” he said proudly when I met him at the station. We proceeded to the exit, Pathak walking with a swagger befitting a politician—his left arm bent to touch his belly and right arm swinging widely with each long stride. Outside, our group of seven piled into two autos and set off for his friend’s house. “It’s all to change the feelings in peoples’ hearts about Modi,” his friend Sushil Taank explained from the front seat as we waited for a train to cross at a traffic signal. Taank was sitting beside the driver and had turned around to talk. Pathak, squished in the backseat between me and his son, his arms raised to give him more wiggle room in the heat, nodded in agreement. I asked a man on a motorcycle who had stopped next to us what he thought of Pathak. The man shrugged and smirked. “If you want to believe, then you can,” he said. As the sun rose in the sky, the day grew hot and we sought refuge inside the modest one-room home. Pathak hung up his vest, and switched from his rimless glasses to a pair with a golden-brown frame. He then wrote me a letter thanking me for interviewing him. After a lunch of rice and curd, which we ate on the two beds that took up most of the space in the room, we climbed into a borrowed jeep to go to the Bara Imambara, a famous Shia mourning hall in Old Lucknow. En route, Pathak changed his turban to another one that was identical, only slightly larger. “Give me your private advice,” he said to me. “This hat or the other hat?” I shrugged and told him it was up to him. The jeep came to a stop near the imambara, but began to roll backwards before anyone could get out. The driver quickly set the parking brake, and we alighted. As we walked to the imambara’s entrance, Pathak’s son shouted, “Narendra Modi!” to which the others screamed “Zindabad!” The group attracted a few stares, but no followers. Pathak entered the gate and took a brisk lap around the imambara’s courtyard. Towards the end of his lap, two men approached and took photos with him. This piece was originally published on April 7, 2014, on The Caravan Magazine.